PLYMOUTH, Minnesota (May 9, 2013) – The new Outback 5000 lb ATV / UTV winch from ProMark Offroad is one of the toughest, most powerful winches available for ATVs, UTVs, and side by side vehicles. This electric winch is specifically engineered for the toughest jobs an ATV owner can throw at it. From offroad recovery to yard work and ranch jobs, the 5000 lb Outback UTV winch offers more pulling power and reliability than any winch in its class. The heavy duty 1.5hp motor is waterproof for use in wet or muddy conditions, and winch line options include a 45-foot ProMark Blue Synthetic Winch Rope or 50 feet of steel cable. The rugged design includes all metal gears and a heavy duty 4-post contactor, along with an upgraded accessory package with a handlebar-mounted thumb switch, fairlead, spring hook and pull strap, line stopper, and electrical wiring. As a bonus, we also include a 10-foot corded winch remote that allows you to power the winch cable in and out at a safe distance. The 5000 lb Outback Series UTV / Side x Side Winch Package comes with a Lifetime Limited Warranty. Our winches are designed to perform up to your expectations for as long as you own the winch, or we’ll repair or replace it. 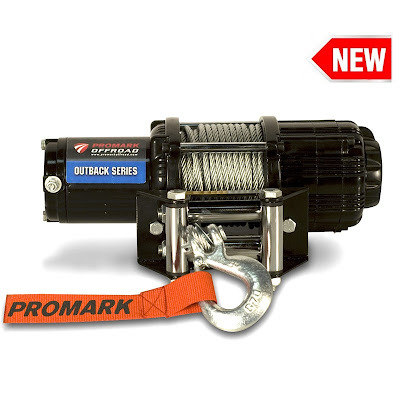 ProMark Offroad offers a complete line of ATV and UTV winches, truck and Jeep winches, and ATV, UTV and 4×4 accessories for the off road enthusiast. To learn more, visit ProMarkOffroad.com.